(Reuters) - Fierce, dry winds were expected to fan the flames of deadly wildfires burning in California on Monday, heightening the risk of fresh blazes from scattered embers and making driving conditions difficult. In the northern part of the state, Butte County Sheriff Kory Honea said at least 228 people were still missing as of early Monday in the so-called Camp Fire, the state's most destructive blaze on record, one of two fires raging in the state that have killed at least 31 people. 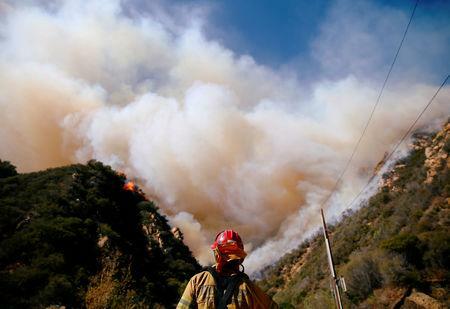 "Winds are already blowing," Chief Daryl Osby of the Los Angeles County Fire Department said Sunday. "They are going to blow for the next three days. Your house can be rebuilt, but you can't bring your life back." In a report to California's utilities regulator, Southern California Edison Company, a unit of Edison International , said it had experienced an outage at a substation in the San Fernando Valley around two minutes before the Woolsey Fire began. The company said it was submitting its report "out of an abundance of caution as it may meet the subject of significant public attention or media coverage." Just last month, PG&E Corp unit Pacific Gas & Electric, California's largest public utility, cut off electric power to about 60,000 customers to prevent wildfires as high winds threatened to topple trees and power lines. Shares of both PG&E and Edison plummeted on Friday as the wildfires spread. Governor Jerry Brown has asked U.S. President Donald Trump to declare a major disaster to bolster the emergency response and help residents recover. Trump criticized the California government in Tweets during the weekend, blaming poor forest management for the infernos.